Here in the following you'll get PSPC Jobs 2019 Punjab Saaf Pani Company Latest Advertisement announced for the Lahore residents holding relevant qualifications and experience for the following vacancies. 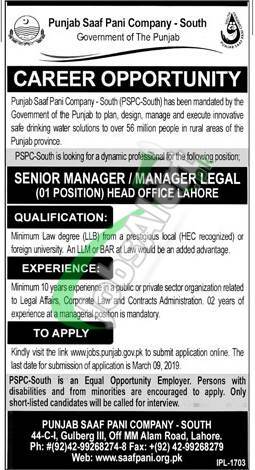 Jobs in Punjab Saaf Pani Company South are such as (Senior Manager / Manager Legal) on contract basis and based at Lahore. Candidates possessing qualification LLB/LLM and relevant exprience are welcome to apply via online at www.jobs.punjab.gov.pk before the last date 09th March 2019.